Heat shock proteins (HSPs) are proteins whose transcription responds rapidly to temperature shifts. They constitute a family of molecular chaperones, involved in the proper folding and stabilisation of proteins under physiological and adverse conditions. HSPs also assist in the protection and recovery of cells exposed to a variety of stressful conditions, including heat. The role of HSPs extends beyond chaperoning proteins, as they also participate in diverse cellular functions, such as the assembly of macromolecular complexes, protein transport and sorting, dissociation of denatured protein aggregates, cell cycle control, and programmed cell death. They are also important antigens from a variety of pathogens, are able to stimulate innate immune cells, and are implicated in acquired immunity. In fungi, HSPs have been implicated in virulence, dimorphic transition, and drug resistance. Some HSPs are potential targets for therapeutic strategies. In this review, we discuss the current understanding of HSPs in dermatophytes, which are a group of keratinophilic fungi responsible for superficial mycoses in humans and animals. Computational analyses were performed to characterise the group of proteins in these dermatophytes, as well as to assess their conservation and to identify DNA-binding domains (5´-nGAAn-3´) in the promoter regions of the hsp genes. In addition, the quantification of the transcript levels of few genes in a pacC background helped in the development of an extended model for the regulation of the expression of the hsp genes, which supports the participation of the pH-responsive transcriptional regulator PacC in this process. 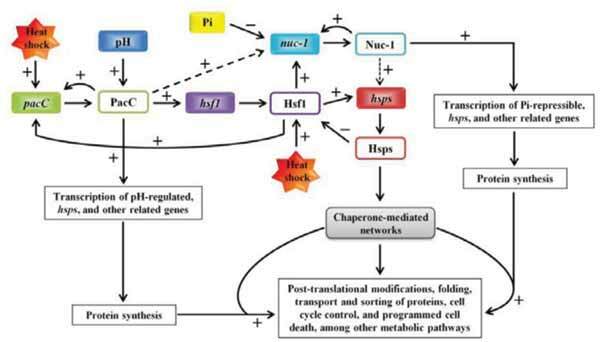 pH regulation, Heat shock proteins, HSPs, Phosphate regulation, Antifungal resistance, Transcription factor Hsf1, Fungal pathogenicity, Heat shock elements (HSE). Department of Genetics, Ribeirão Preto Medical School, University of São Paulo, 14049-900 Ribeirão Preto, SP, Brazil.